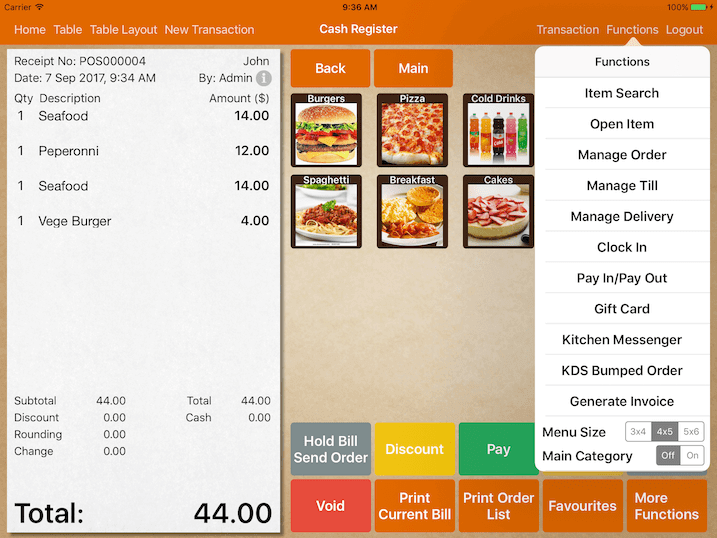 A list of functions that can be accessed in cash register. Item search gives you a quick search on item name. Item with modifier is marked with an arrow beside. For miscellaneous item, you could use open item. Assign the kitchen printer if item has to be sent to kitchen. If tax is setup, you will be able to configure the tax for this open item. For order that has not been sent to kitchen, you could choose which order to be sent. 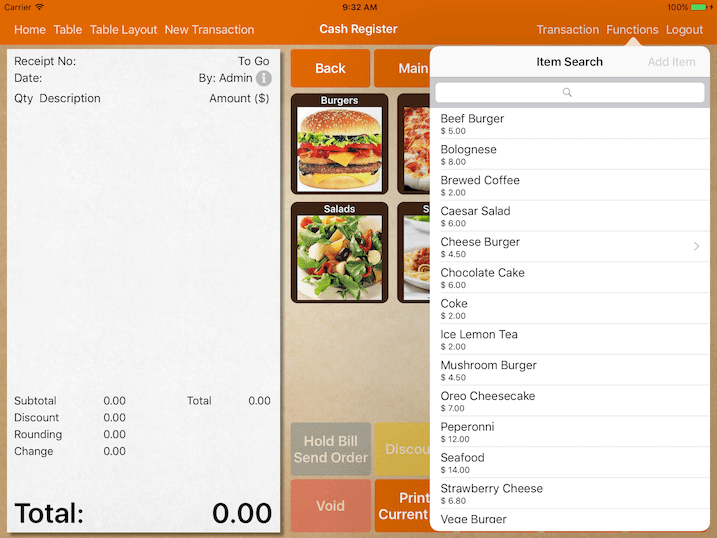 For example you could key in all customer orders but only fire the appetizers first. Order that has not been sent to kitchen will be marked as red. This feature allows user to track the cash flow in the drawer. In normal operation situation, staff should specify the amount of the cash they hold in the opening till. At the end of the day, after calculating all the cash they have in the drawer, they will key in the amount in the closing till. 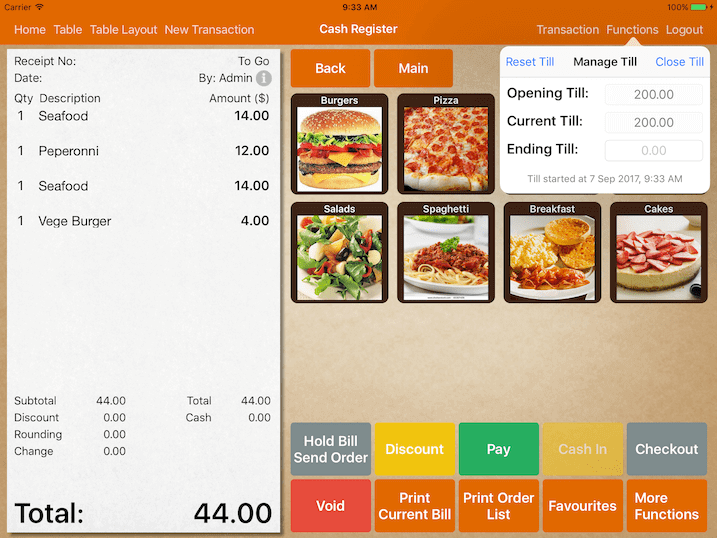 This allows the system to calculate the variance comparing to the actual cash sales. To use this feature, go to Cash Register -> Functions -> Manage Till. Next, user will need to insert "Opening Till" amount, then click on "Set" at the top right corner as shown below. If your opening till is $1000.00 and you just close a cash sale of $33.95, the current till amount will be as shown below. The time when the till is started is shown as well. 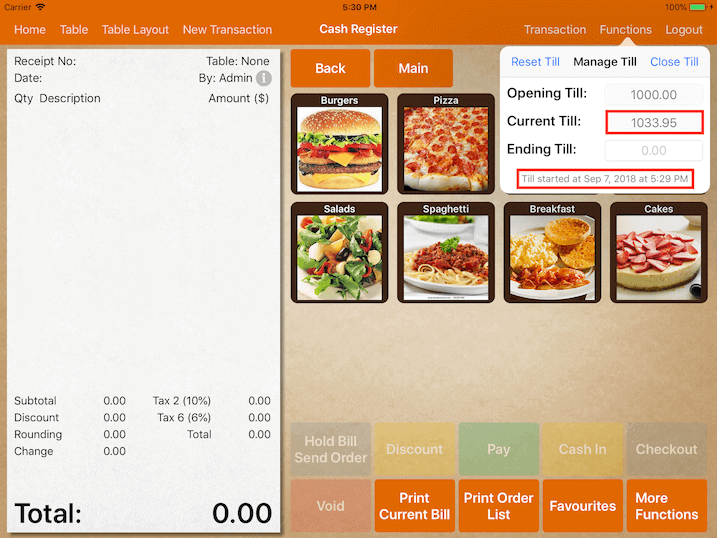 At the end of the shift, staff is required to close the till by inputting the ending till amount at the "Ending Till" column, then select "Close Till" at the top right corner as shown below. Based on the example above, in the Z reading report, it will show a positive variance of $1.05. 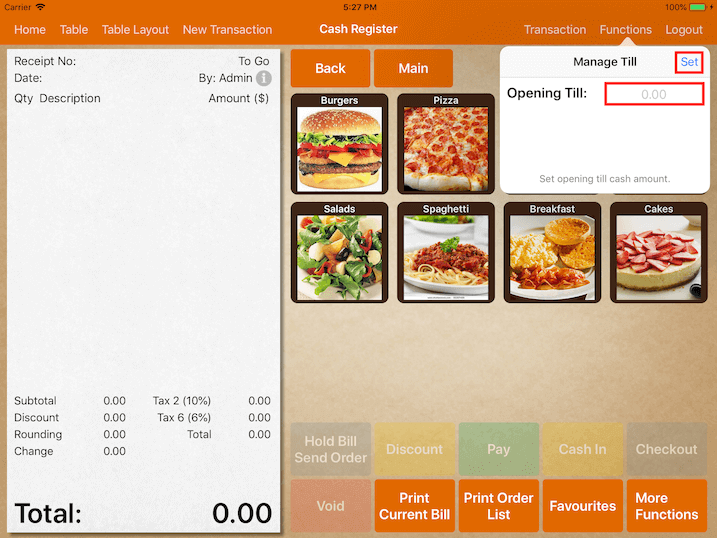 After closing the till, user can also re-open it by selecting "Re-open Till" at the top right corner as shown below. Upon re-opening till, the "Ending Till" column will cleared off as if the till is not closed before. If user wish to restart the till again, you can click on "Reset Till" as shown below. Reset till clears off the entire shift record. Do note that user will need to open till at the start of the day or before any transaction is closed. Current till amount that is shown will only include transactions that are closed after the till is opened. All the sales or transaction that happened before setting up "Opening Till" will not be recorded under the till section. Staff is given $1000 to start the day (10:00 a.m.), however staff did not open the till and they proceeded with transactions. By 10:30 a.m. they have received $200 in sales and they realise they did not open the till. If they proceed to open the till with $1000, the current till amount will be incorrect. As the till will only calculate cash sales that are done after 10:30 a.m., missing out the transactions before, showing $1000 as the current till amount. The correct way, they should recalculate what is in the drawer which is $1200, then enter that as the opening till amount. Or else they would have to change their iPad date to 10:00 a.m. then key in $1000 as the opening amount. Then adjust the device back to actual time. To prevent this from happening, enforce till should be turned on. To enforce staffs to start the shift or till before the first sale of the day, go to Settings -> General -> scroll all the way down and enable Enforce Till. Upon enabling Enforce Till, "Opening Till" must be set up before the first transaction and all bills must be closed before closing till. 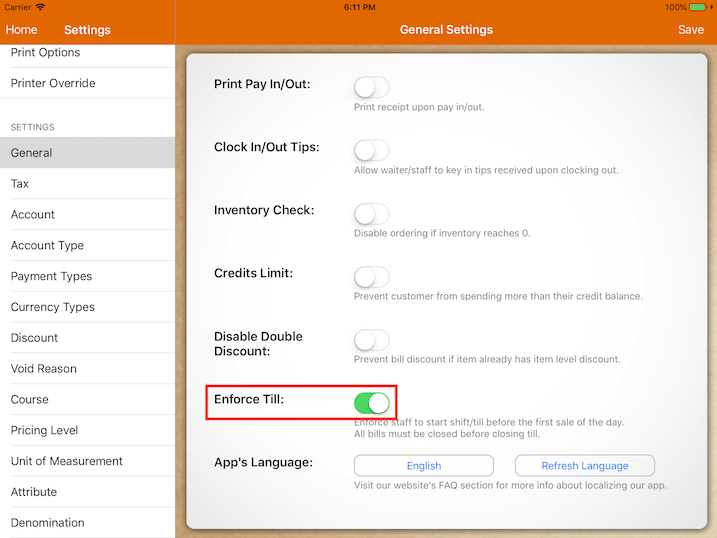 Do note that Enforce Till can only be enabled in the Main POS. In screenshot shown above, current till amount is shown when user manage till. Only user logged in with super admin privilege will be able to see the current till amount. Non super admin should only see masked figures as shown below. This will prevent staff from pocketing extra cash that is received. If you have multiple terminal, manage till feature can also be used to track each individual drawer. User needs to first connect each terminals to the main POS. To understand device pairing, you can read more about it here. In order to manage till individually, terminal ID has to be keyed in under Settings -> Terminal -> Terminal ID. 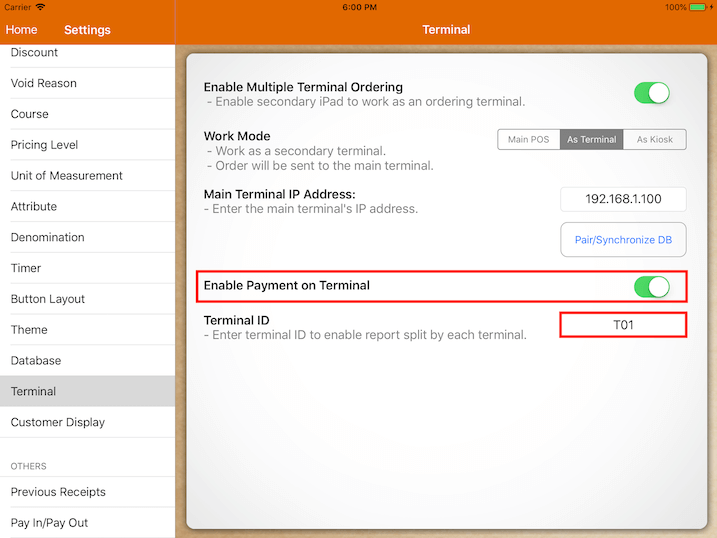 If the terminal ID is keyed in, both main POS and terminal are required to manage their own till and only transactions that are closed in this terminal will be taken into consideration for this terminal's till. If the terminal ID is blank, the cash till of the terminal will act as one along with the main POS. It will combine the transaction for both terminal and main POS. Manage delivery gives you an overview of all your delivery transaction. You could assign driver for each of the transaction based on the location and delivery time. If the logged user has not clocked in, Clock In will be displayed. If logged user has clocked in, it will display their clock in time and Clock Out will be displayed. User can only clock in for themselves and they can clock in/out multiple times a day. Use a negative value for cashing out. 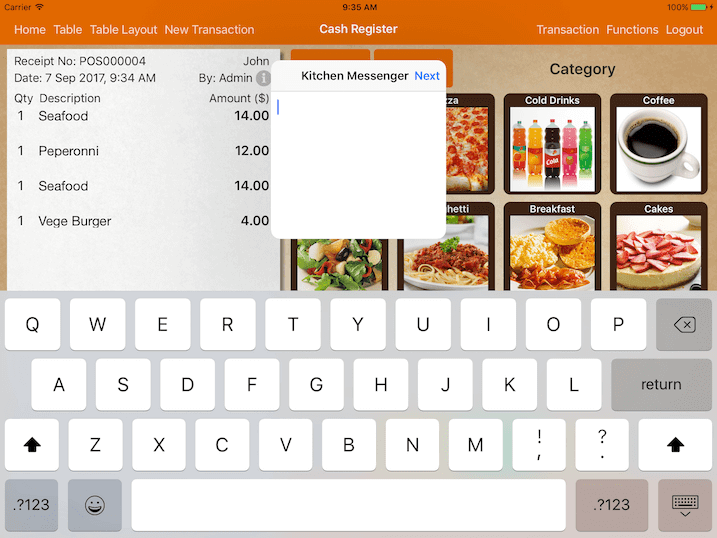 Using any device, you could send message to the kitchen printer or kitchen display app. Kitchen printer will print out a docket with the message sent while kitchen display app shows an alert. You could send a message to multiple printer/kitchen display at once. If Notify POS when bump is turned on in the kitchen display system, POS will receive the notification. This allows checking of previous bumped order. Generate invoice for bill selected. Option to print or email to your customer. 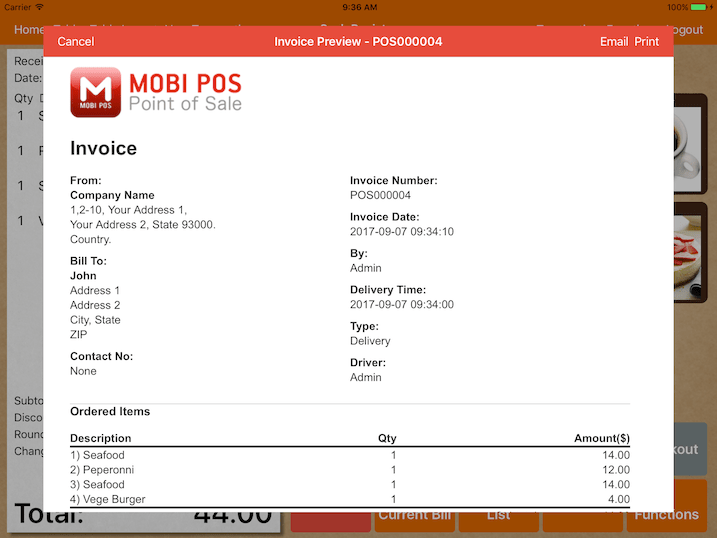 Invoice can be printed to AirPrint supported printers only. Adjust the size of menu buttons. 3x4, 4x5 or 5x6 without product thumbnail. Off - Main category will be displayed in the menu. Function buttons will be shown below menu. Use this option if functions are accessed frequently. 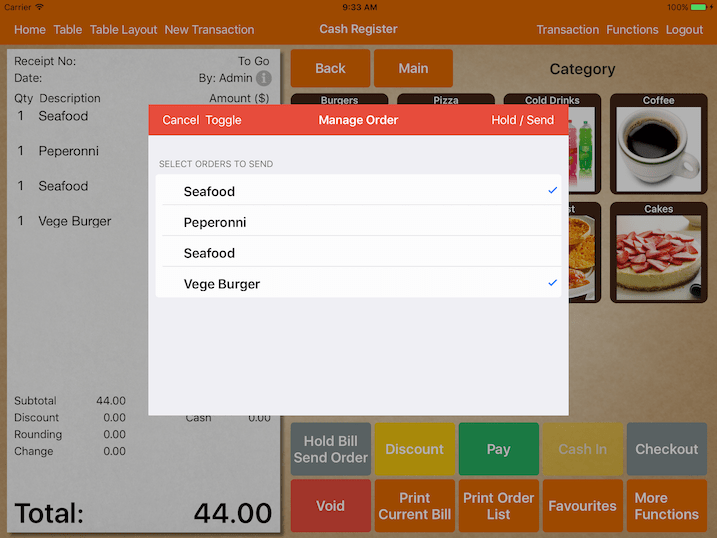 On - Main category will be displayed under the menu which enables quicker switching between categories. In order to access all functions, click Function button that is located below the receipt.